Singalong songs, short environmental stories, and interactive games that demonstrate environmental issues and solutions in the world today. Martin’s songs promote recycling, conserving water, knowing where your electricity comes from, eating healthy for yourself and the Earth, and choosing sustainable meat sources. 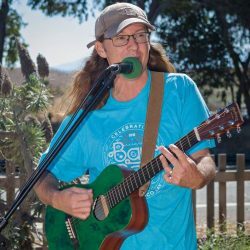 His lyrics are simple, his melodies are catchy and easy, and his show is engaging, entertaining, and educational.